This sketch for the beginning of the Finale of K.450 shows how Mozart sometimes captured his musical ideas on paper. Early in 1784 Mozart had an idea for the refrain of a piano concerto finale. Taking a leaf of music paper on which he had previously drafted the beginning of an otherwise unknown choral fugue in C, he jotted the concerto idea on the empty top staff. The red notation on the transcription page represents Mozart's second thoughts. Multiple, later hands appear on this sketch leaf, providing insight into the history of this manuscript’s survival after Mozart’s death. In the top margin Constanze Mozart's second husband, Georg Nissen—who in the late 1790s helped her to catalogue Mozart's musical estate—wrote "By Mozart and in his hand." 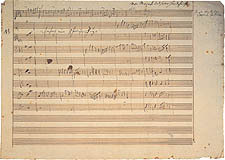 In the left margin and between staves 2 and 3, Maximilian Stadler, a friend and chief assistant in the effort to turn the estate to cash, wrote "NB / Beginning of an 8-voice fugue." In the upper right margin an unknown hand correctly identifies the piano concerto finale. [top] Wolfgang Amadeus Mozart. Sketch of the beginning of the Finale of K. 450. Neue Mozart Ausgabe, vol. X/30/3, ed. Ulrich Konrad. [bottom] Transcription of the New York Public Library sketch leaf.